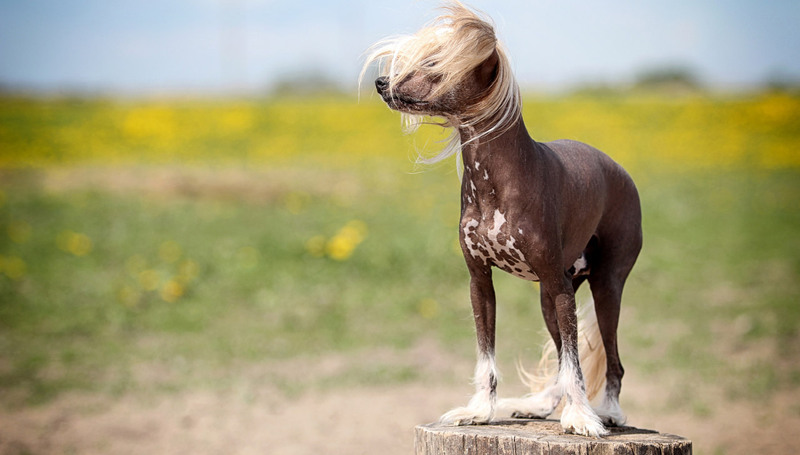 The Chinese Crested is a sweet-natured dog who comes in two distinct and uniquely glamorous varieties. The Hairless Chinese Crested is famed for being free of hair over most of the body, but having a mane of hair on their fur and puffs of fur on their feet and tail. The Powderpuff version has hair all over. Both varieties are born in the same litter, with the Powderpuff version an expression of a recessive trait. Chinese Cresteds are loving, playful companions, who are attuned to the moods of their people and devoted to the members of their pack. The hairless version of the Crested is sensitive to bright sunshine and the cold, while both varieties are fine boned and delicate. Chinese Cresteds are also called Cresteds, Puffs, and 'Dr. Suess Dogs,' because they look like the children's author could have dreamed them up. Coat - The Hairless Crested has fur on their head, tail, and lower front and legs, known as the crest, plume, and socks, respectively. The hair is soft and silky to the touch and grows long. The skin, where it is exposed, is fine and smooth. The Hairless variety may or may not have hair on their ears and face. On the Powderpuff Chinese Crested, a soft and silky double coat covers their entire body. Any coat color or color combination is acceptable. Chinese Cresteds are elegant and graceful, with hair or without. They are fine-boned and slim, with an arched neck and slightly curving tail. Their almond-shaped eyes are alert and watchful. The Crested's gait is lively and smooth, denoting agility. They are at turn playful and the ultimate lap dog. They are known to be sensitive to their owner's moods. The Chinese Crested did not come from China originally. Their roots possibly connect with hairless dogs in Africa, and some genetic evidence indicates an ancient connection to the Mexican Hairless Dog. When these dogs arrived in China, they were bred to be smaller and were eventually used to hunt rodents on trade ships, coming to be called 'Chinese Ship Dogs.' The breed was thought to have healing powers and was prized by Emperors and mariners. The Chinese Crested's work on ships took them around the world, and eventually to Europe in the 1700s. The breed was imported to the US in the late 1800s, where it was promoted by breeders Ida H. Garrett and Debora Wood, the latter the founder of Crest Haven Kennel that established the breed standard. Chinese Cresteds gained widespread attention when popular burlesque dancer Gypsy Rose Lee kept them as her beloved pets. When she died, Lee's dogs joined the dogs of Crest Haven, and these two lines are related to all Chinese Cresteds today. The first American club for the breed was formed in 1974. Chinese Cresteds are happy, social animals who bond closely with their families. They may be shy around strangers, but they come around once they get to know you. A Crested's favorite spot is in their cherished human's lap, but they enjoy getting down for the occasional playtime. Are Chinese Cresteds Good with Kids? Chinese Cresteds adore the kids in their own family. However, children should learn how to play safely with Cresteds. The breed is so delicate, they can be injured easily during rambunctious play. Are Chinese Cresteds Good with Other Pets? Chinese Cresteds who have been socialized with other animals are accepting of other dogs and cats in the house. The breed should not live with large, rambunctious dogs, however, because they are at risk of injury from overzealous furry friends. Chinese Cresteds are somewhat territorial, but not especially protective. Are Chinese Crested Good Guard Dogs? Chinese Cresteds are alert and watchful. They'll sound the alarm at the approach of friends and strangers alike, but they are too little to intimidate anyone. Chinese Cresteds have moderate energy levels. They'll toggle between playtime and lap time throughout the day. Chinese Cresteds are difficult to housetrain. They are adaptable to apartment living. They can escape or jump fences that aren't well secured. They're fragile and must be watched closely around boisterous children and large dogs. They will serve as a body warmer under the covers whether you like it or not. They need a jacket in winter and air conditioning in summer. They require protection from sunburn. They can be stubborn at times. Indoor Chinese Cresteds should live indoors with their families. This alert breed will keep you company wherever you go in the house. There isn't much fur to clean up with this breed—Cresteds have very little hair and Powderpuffs shed very lightly. Outdoor Cresteds enjoy playing outside, especially in pleasant weather. When it's cold outside, you may have trouble cajoling your Crested outside for even a minute in the yard. They should always be well protected when it's cold or snowy with sweaters, dog coats, and booties. Exercise Chinese Cresteds can get enough exercise from dashing around the house and lively play sessions in the backyard. Endurance Chinese Cresteds have the stamina for 30-minute play sessions or walks, after which they'll want to kick back on the couch. Running Miles: Chinese Cresteds may run with you across the yard a time or two, but they are too little to accompany you on long runs. Hiking Miles: Cresteds are more suited to walks around the neighborhood than walks in the woods. Without any protective fur, their skin is at risk of scratches. Food Generally, this breed requires about ½ cup to 1 cup of good quality dry dog food each day, given over the course of two feedings. This will vary based on your Crested's activity level and age. Talk to your veterinarian about the optimal diet and quantity of food for your Crested. Alone Time Though they'd rather not, Cresteds can entertain themselves for a few hours at home on their own, especially if they have their favorite dog toys handy. The Crested's skin needs special attention, including daily washing with a gentle cleanser and moisturizing with a dog-safe lotion or oil. They also need to wear a dog-safe sunscreen whenever you take them outside on bright days. The Powderpuff variety should be brushed every day to avoid matting, and given a bath every few weeks. Brush their teeth several times a week, and trim their nails every month or so to prevent cracking. You can minimize serious health concerns in a Chinese Crested by purchasing from a reputable breeder who engages in responsible breeding practices, and through screening for common diseases and conditions. Chinese Cresteds are bright, eager-to-please dogs who will ace 'Obedience 101'. They do have a stubborn streak, so patience and consistency are the keys to a well-mannered Crested with good social skills. As long as it means spending time with their family, Chinese Cresteds will be happy to learn more advanced skills, such as agility, rally, and even lure coursing. Delicate and small, Chinese Cresteds are not suited to hunting. Are Chinese Crested Powderpuffs hypoallergenic? Yes. Even though Powderpuffs have hair over their entire body, the variety is still considered hypoallergenic because it doesn't shed excessively. The Crested hairless variety is hypoallergenic because they have so little fur. Do Chinese Crested dogs sweat? Yes. The Chinese Crested is one of the only dog breeds with sweat glands and that can cool down without panting. Chinese Cresteds can learn to swim, but most of them don't enjoy the water. Their low-fat bodies get cold quickly. They also have sensitive skin, that may react to chlorine and is easily sunburned.